Today's business challenges are both epic and unprecedented, which, if not met by quick and decisive actions, can result in catastrophic consequences. Taking control of IT is one of the best ways to take control of your business. 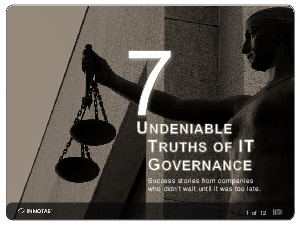 Learn the seven undeniable truths of IT governance, and how companies can take the ambiguity out of managing IT so they can guide their businesses forward.